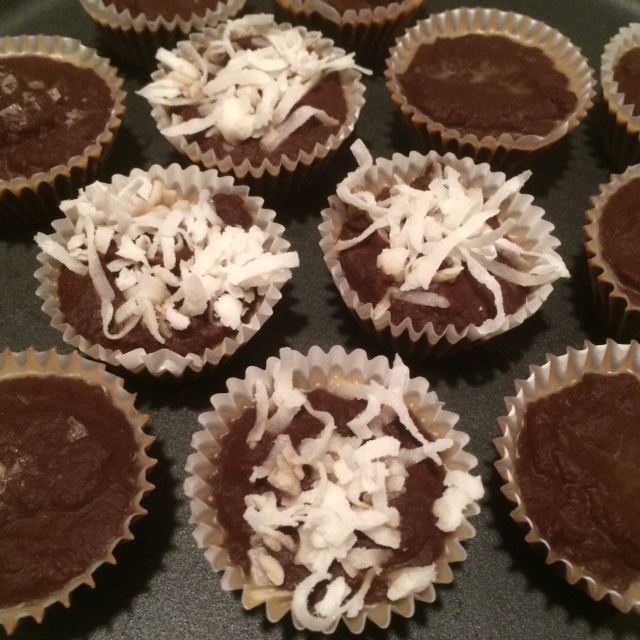 I love finding a dessert recipe that is free of white sugar and is mostly good for you. Oh, and of course that tastes good. We recently found a recipe that has three ingredients. Chocolate chips, coconut milk and coconut oil. That is it. Hard to believe, but they are oh so good and of course rich too. With just the two of us, we split the recipe in half (below is the full recipe). Even then it took us a few days to finish them. 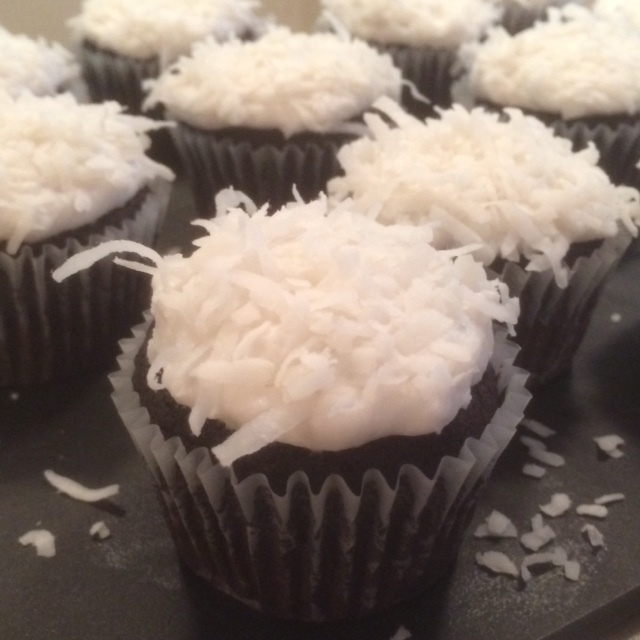 We topped a few with shredded coconut, a few others with coarse salt, and left some plain. My favorite was the coarse salt. It added just the needed amount of salt to cut the richness. Place the chocolate chips in a large bowl. Combine the coconut milk and coconut oil in a small pan, and bring to a boil, whisking occasionally to ensure the coconut oil melts fully, and the milk warms evenly. Pour the hot coconut milk/oil mixture over the chips, and let sit for 2 minutes. Whisk until totally smooth. Line a mini muffin pan with liners, and grease liberally. Fill each liner to the top (a heaping tablespoon of the chocolate). Sprinkle sea salt on top (or any of the other toppings listed below). If using caramel, drizzle 1/2 teaspoon on each fudge bite, and use a toothpick to swirl. Freeze (1 hour) or refrigerate (2-3 hours) until set. You can store your finished fudge bites in the fridge or freezer. As you may guess, storing them in the fridge makes them a little softer, and the freezer makes them slightly firmer. They never freeze. They will melt if left out on the countertop. The chocolate chips are key to the quality of the fudge, so use Ghirardelli or Guittard (if not vegan), or Enjoy Life (if vegan).